The City of Tybee Island lies about 15 miles east of Savannah and serves as the easternmost point in the State of Georgia. Its population of about 3,000 residents swells in the summer as tourists from across the Southeast visit this laid-back island community. Tybee, like many other beach towns, contains many of the features of a denser, urban community, yet produces much less hostility to such environments. Though we can’t replicate the inherent relaxed mindset produced by small towns centered on a leisure activity, by bringing some of the design features of such towns to larger communities we can create a slightly more pleasureful experience. Tybee provides some great examples of useful transferable features and could make these features even greater with a few changes. 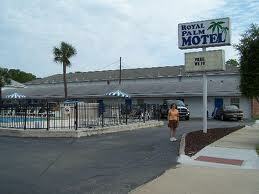 On a recent trip to Tybee I began to think about all the things that make being there enjoyable. Obviously the beach is the main attraction and the predominant reason why people either visit or live in the city. Those that do visit are likely on vacation; not having to deal with work or any other daily stress is clearly enjoyable and would be enjoyable regardless of your location (generally). So those are two constants that cannot be replicated in other cities (unless it’s Dubai or China, in which case you just simply build a beach in the city). This leaves two main features of Tybee, and many other small beach towns, as major contributors to enjoyment: walkability and nature. Simply being able to step out of your house and easily walk to the beach, the store, or wherever is highly enjoyable and relatively stress-free. Tybee is a small island so everything should be easily accessible by foot or bike and for the most part this is the case. Walkability in such circumstances sounds easy to achieve, but design flaws have serious impacts on people’s desire and ability to walk to things (see this amazing example and my post on Atlanta’s 8th and Monroe development). Driving tends to make us too goal-oriented in that we will stop at nothing to get to where we need to go; this produces stress and makes us oblivious to everything around us. While walking slows down the pace, it allows us to observe so much more. This could be in the form of an interesting architectural feature of a building, a store you never noticed, wildlife, or even your neighbor! Though sometimes we need the speed of driving, there are clearly many advantages to a slower more relaxed pace. Aside from being a geographically small city, Tybee creates walkability through small, shared streets. 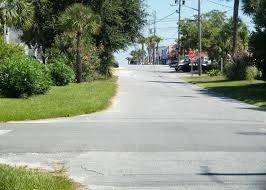 Most streets on Tybee are very narrow and contain no sidewalks. 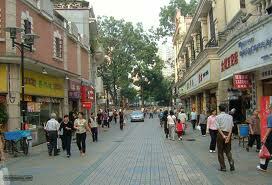 The narrow streets encourage slow driving and the lack of sidewalks requires pedestrians to be in the street. The shared street concept requires drivers to be cautious at all times, which produces a more casual street atmosphere that reduces stress for walkers and cyclists. Sidewalks are great, but they are confining and allow drivers to pass through quickly, which ultimately increases vehicular traffic and makes walking more stressful. Now ripping out sidewalks, or not provided them in the first place, only works when people could reasonably walk somewhere and the convenience of walking outweighs the convenience of driving. This works on Tybee because in most parts of the city, the beach is relatively close by foot or bike and parking is limited. In larger cities destinations are made closer by increasing density. Tybee’s convenient walking atmosphere can be replicated by simply making things so close that driving doesn’t make much sense. As I mentioned in a previous post, more formalized shared streets are used throughout many large cities to induce and protect a walkable environment. Now this obviously can’t be adopted on every street in every city, but it can and should be when appropriate. For Tybee, this is almost every street except for 1st Street/Butler Avenue. Corridors should be strictly divided to efficiently move vehiclular traffic, but bigger cities can create the relaxed, collaborative atmosphere of Tybee in their neighborhood streets by adopting a shared policy. The other aspect of Tybee that can be replicated is the abundance of nature. Sure we can’t put a beach in every city or suburb, but we can dramatically increase the amount of interesting fauna. Tybee is relatively ungroomed and that makes it interesting. All sorts of different plants and trees are growing in yards or in public areas and this makes walking much more enjoyable. Cities can replicate this by providing more frequent open space that isn’t necessarily nicely groomed parks; let nature do its thing in confined areas along streets and in neighborhoods. We can’t bring the beach or marshlands found naturally on Tybee to every city, but we can preserve and build around natural land and we can attempt to replicate natural environments throughout cities. My critiques of Tybee are simply that they should consider strengthening existing features. Though many of the streets are seemingly shared streets, they aren’t officially shared streets. Tybee still designates bike lanes (though these are completely indiscernible except for a sign with a bike and arrow); this implies that bikes have protection in some areas, but not in others. The city either needs to clearly mark bike lines everywhere or formally adopt shared streets. The same goes for pedestrians. Though everyone readily uses the streets for transportation, as a walker you still feel threatened every time a car passes. Legally the car still has the right-of-way, but we have informally adopted a shared streets policy. This creates confusion; either build sidewalks or declare a formalized shared street where cars can longer legally fly past pedestrians. For most residents and tourists who stay on the island almost everything is accessible by bike or foot so it makes sense to adopt a shared streets policy that encourages comfortable walking and biking. Tybee should consider rezoning parts of Butler Avenue. Contrary to my belief, Tybee does have a zoning code, and it’s a rather extensive one for a community of 3,000. The city is divided into a number of generally use-exclusive districts, including several designed to protect marine and marshland areas. One interesting aspect of the zoning code is that the main thoroughfare, Butler Avenue, is zoned residential until around 14th Street where it transitions to commercial. I like the idea of confining more of the heavier commercial uses to one zone at the end of the beach, but I think the rest of Butler Avenue should be rezoned to allow limited commercial use. It doesn’t make sense for the main arterial road to be largely confined to residential uses. Interestingly a similar type of zoning that should be used is already envisioned in the zoning ordinance, yet unless I am looking at an outdated map it doesn’t seem to be implemented anywhere. The “Transitional Business-Residential” (TBR) district calls for the mixing of certain commercial properties with residential properties around the area zoned C-2, which is in place along 1st Street before it turns into Butler Avenue. I don’t see the TBR zoning currently being used, but it should be amended to nix the requirement that it be used around the C-2 zone and to better define what commercial uses can be implemented in the zone. There is no reason why TBR should be restricted to one area of the city if it makes sense in other parts. Perhaps a new district should be created that isn’t based on transition, but on the general mixing of commercial and residential uses with the overall idea being the protection of residential qualities. Butler Avenue should then be rezoned to this new district so that residential and commercial spaces can be used. Right now, the majority of Butler Avenue is residential, which means people that live there have little reason to casually stroll along it. Adding some more commercial space could create a more vibrant street environment that encourages people to walk or bike from the north end of the island to the south end. Just How Sensible and Effective is Georgia's Effort to Reduce Inflated Property Tax Assessments?